Our range of Wooden French Doors are available either as traditional, set into a deep 95mm timber frame or as a Stormproof style set into a 68mm frame. Our 58mm door leaf is produced from Accoya as standard for unrivalled dimensional stability. No more sticking doors, no more time wasted on needless call backs. Other timber options such as Oak are available. Our Stormproof style 68mm Timber Door comes as standard with 3D adjustable hinges for ease of installation and adjustment. 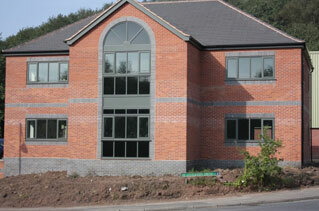 The unique 'lipped' stormproof style offers double draftsealing particularly suitable for exposed areas. We have been a trade supplier of Timber Front Doors for 28 years, continually improving our products in that time. All our Wooden Doors are CNC machined for unrivalled accuracy & quality and are backed up by the same comprehensive guarantees found across our range of Timber Windows & Doors. A pair of Wooden French Doors makes a statement that has tried to be imitated but cannot be matched. Included in our range are options of raised & fielded panels, flat panels, tongue & groove boarding and insulated core panels. 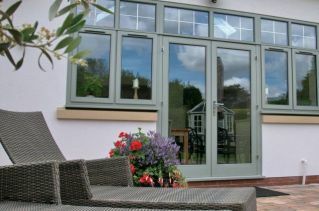 A range of glazing options are available, clear, stained, obscure, sand blasted to give the look that you require. Our glazing is as standard fixed using our secret nailing system so none of the pin holes are seen and don’t have to be touched up. This reduces the time to glaze the doors and also looks much more aesthetically pleasing. Available in our extended range of standard entrance door colours or we can colour match to any RAL colour. Our wooden French doors are painted using environmentally friendly Teknos paint which is microporous and allows the wood to ‘breathe’. Our paint finishes are backed up by our 8 year opaque paint guarantee.